The Everest Marathon is listed in the Guinness Book of Records as the highest marathon in the world. The starting line is at Gorak Shep 5184m (17,000 feet), close to Everest Base Camp in Nepal. The finish is at the Sherpa town of Namche Bazaar at 3446m (11,300 feet) and the course is 42 km (26.2 miles) over rough mountain trails. It is the world’s most spectacular race and has been held sixteen times every two years since 1987. To acclimatise naturally to the high altitude all runners join together for a 26 day holiday in Nepal. This holiday combines sightseeing in the capital, Kathmandu, a 15 day trek to the start under medical supervision, ascents of Gokyo Ri (5483m) and Kala Pattar (5623m) for the best views of Everest and one of the mostgrueling races in the world. Although the course is basically down hill, there are two steep uphill sections. There may be snow and ice on the upper part and there is considerable exposure along much of the route. For this reason the race is only suitable for runners with recent experience of cross country, fell or mountain running and endurance events. Experience of rough terrain is essential and road marathon experience is not sufficient on its own. 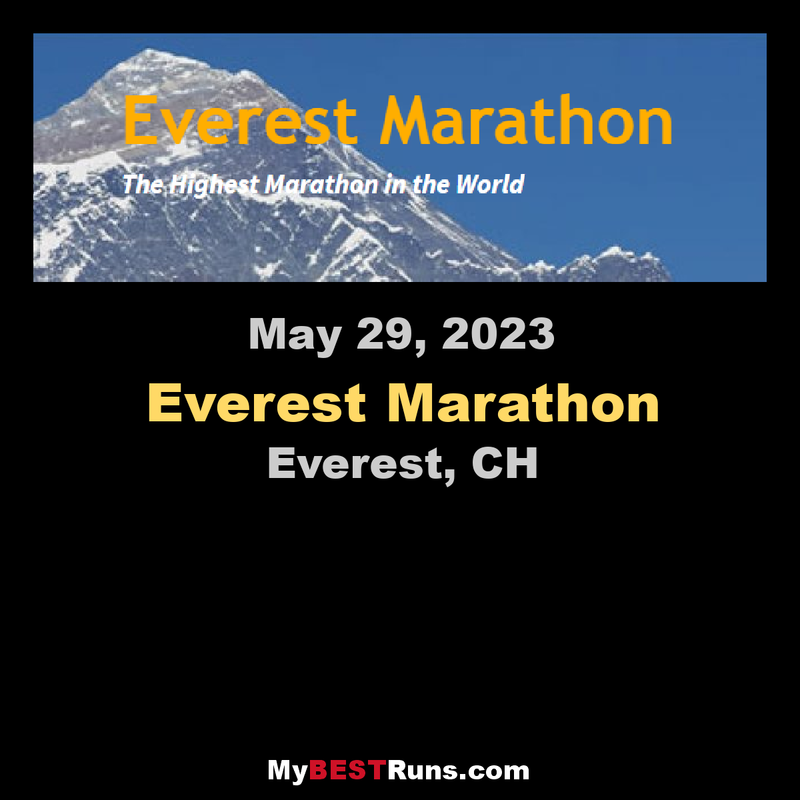 The race is a non-profit-making ventureorganized by BufoVenturesLtd with all profits put into the EverestMarathonFund, a UK registered charity (number 1005422). So far this has raised over £631,000 ($834,000US) to support health and educational projects in rural Nepal. Most of the money has been raised by the runners themselves and many divide the amount raised, with 50% to the Everest Marathon Fund and 50% to a charity in their home country. In this way the race has also raised large sums of money for a wide range of good causes around the world. Eachrunner can set up his own web site page on the Virgin Money Giving web site invitingdonations to madeon line directly to the Everest Marathon Fund. The course record was set in 2013. Ram Kumar Raj Bhandari of Nepal posted a time of 3:40:43 in 2013. The best female timewas posted in 2009 by New Zealander Anna Frost. Her time was 4:35:04. She is the only women who has run better than five hours. Ray Brown of New Zealand in 1993 ran 4:28:38 which is the best veteran's time. After a few doubts caused by the Nepalese earthquake earlier in the year, I am pleased to report that the 2015 Everest Marathon is underway with a reduced party this year of 43 intrepid souls converging on Kathmandu from 7 nations.Despite all the bad news reported from Nepal, we have been made very welcome by the Nepalese and find Nepal very much open and ready for business. After a brief delay due to early morning fog in the Kathmandu Valley, the group flew into Lukla and started trekking up to Namche Bazar with an overnight stop at Phakding. En-routeit was possible to see a small amount of earthquake damage and a few resultant landslides, but the Nepalese are on top of the situation and the paths are good and their houses are being repaired to a good standard. 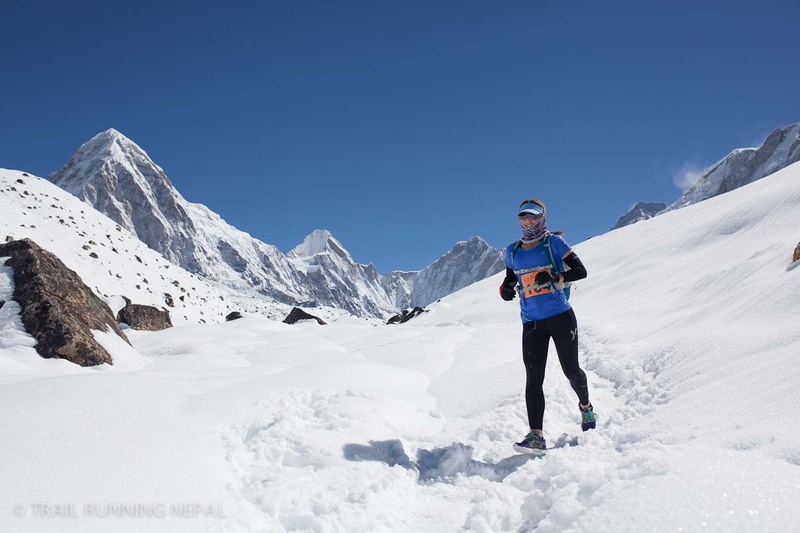 It has been said that that the hardest part ofthe Everest Marathon is getting to the start. This year was particularly successful inthat all 49 runners reached the start acclimatised and in good health. The weather was good and not too cold at the start making ideal running conditions. As expected the Nepalese runners excelled in their natural environment, but the course record remained just out of reach by some two minutes. There was much interest in the women’s placings as local favorite, Mera Rai, was the focus of a BBC film crew who are making a documentary to be broadcast in the Spring of 2017. Off-road running experience is essential because of the nature of the Everest Marathon course. Road running experience is not sufficient (except for training purposes). As applicants come from all over the world, it is difficult to recommend particular races. Asia: Mongolia Sunrise to Sunset, Mount Kinabalu International Climbathon. Endurance events such as ironman triathlons + some off-road experience. Yes. On race day you must be at least 21 and under 66. For the 2017 race this means birth dates 26 Nov 1951 and 27 Nov 1996. We accept non-runners (marshals) from 18 – 69. Ifarranging your own flights to Nepal: £2450. Extra hotel accommodation can be arranged in Kathmandu to suit your flights. Go to official website for additional details.